Nowhere is the heft and glory of history more palpable than in the book arts. The 19th century brought several innovations, both functional and æsthetic, to the craft of bookbinding. Advances in mechanisation enabled publishers to start producing books on a large scale while staying true to the exquisite, ornamental beauty of the cloth- or leather-bound book. 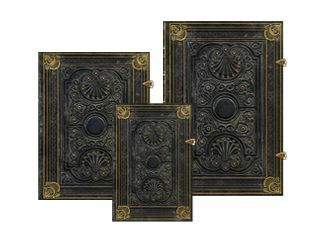 Our reproduction of an antique French binding is based on a cover designed in 1829 by publishers A. & W. Galignani for "The Poetical Works of Thomas Moore." It features many of the hallmarks of fine binding from that era, when book designers looked to their forebears from the 15th, 16th and 17th centuries for guidance.